Italy, 1970, 96 minutes, Colour. Klaus Kinski, Peter Carsten, Antonio Cantafora, Marcella Michelangeli. Directed by Anthony Dawson (Antonio Margheriti). This is a little-known spaghetti-Western but one which deserves some attention. It was made in 1970, with the 1960s into the 1970s as the key era for the spaghetti Western, often filmed in Spain. They always had an American setting and often the directors and the actors took Anglo-names. This is the case here with Anthony Dawson, the name for Antonio Margheriti, a specialist in Italian horror films who also made a number of westerns. The film opens with prisoners in a quarry, in the aftermath of the Civil War. One of the prisoners, Gary Hamilton, is played by Klaus Kinski, in his early 40s at the time but looking far less weatherbeaten than he did in later films. For those who remember his raspy voice, it is somewhat disappointing to find the rather smooth American voice that was used to dub him in English. Suddenly, he is freed and given a pardon by the president because of his military service during the war. However, after 10 years in prison, he is consumed by the need for revenge. He travels to the town where he was victimised by an associate who set him up as responsible for a stagecoach robbery, planting evidence, and his mistress then betraying Gary Hamilton to the authorities. On the stagecoach back to the town, he encounters the son of his enemy who knows nothing about the situation, acts innocently on his return, is promised money and the possibility of being governor by his ambitious father, then wants to know the truth, here’s it from Gary Hamilton, decides that, despite his antipathy towards his father’s behaviour, he must defend him and kill Hamilton. One of the ironies of the film is that his father shoots him by mistake, is desperate, blames his mistress and then shoots her. A tornado is brewing and there is a lot of commentary about the wind and the weather symbolising what is to come. Most of the people in the town belong to a group dominated by the wealthy landowner and come out in his support – with a lot of gun fighting and shooting in the streets, in buildings, even in the church, horses let loose against these men, one tied in a noose in the belltower. And, the bell keeps bringing, unnerving people in the town. There is a priest, a preacher (wearing a Roman collar and called father as well as preacher though the church is very generic with candles, pews and an organ). The preacher encounters Hamilton but does not say anything, rather going to play the organ – where he is attacked by some of the shooters, challenged but still not saying anything, and murdered. The only support Gary Hamilton has is from a lame doctor in the town and the woman who runs the saloon both of whom help him. There is a whole range of villains who are shot, Hamilton using his wits and stealth, the shadows, the wind, the church bell. Ultimately, of course, there is a long shootout between the villain and Hamilton, in the interior of his mansion, the film using quite effectively the device of a hall of mirrors with many reflections of Hamilton, as well as the mistress knocking over a lamp as she is killed beginning to set the mansion on fire. Ultimately, while trying to reach for bullets to reload, reloading and then aiming, the villain is killed. At the end, Gary Hamilton goes to the saloon and reassures the owner and others that if they go into the mansion there will be enough wealth for them to rebuild the town. As Hamilton rides out, the title comes on the screen, the quote from Genesis about Cain being cursed and becoming a vagabond and wandering throughout the earth. 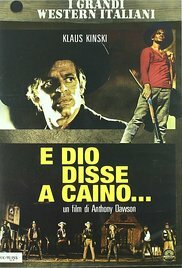 A spaghetti western well worth seeing and reflecting on.